Maurizio Sarri will have a taste of the Premier League for the first time today as they face Huddersfield town at the John Smith's stadium. 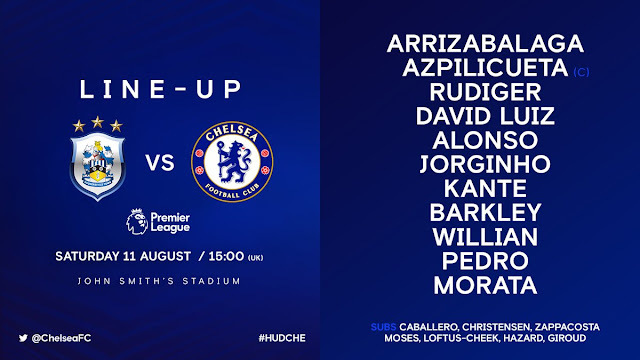 The Italian coach has named new goalkeeper Kepa Arrizabalaga, new signing Jorginho and Willian in the starting line up with Eden Hazard and French World cup winner Olivier Giroud on the bench. Chelsea XI vs Huddersfield: Arrizabalaga, Azpilicueta, Rudiger, David Luiz, Alonso, Jorginho, Kante, Barkley, Willian, Pedro, Morata. Subs: Caballero, Christensen, Zappacosta, Moses, Loftus-Cheek, Hazard, Giroud. Click on this link to watch the full match highlights.